When Disney acquired Star Wars and Lucasfilm announced the all the stories of the Expanded Universe had been jettisoned, it seemed like a galaxy far, far away was getting a fresh start. But that hasn’t totally been true, as pieces of the EU keep making their way back to the new canon. Now it seems like Star Wars may—may—be adding back a certain idea that probably should never have existed in the first place. If you’re thinking “space orcs,” you’re right. Except they were motivated by a religion that essentially deemed technology to be blasphemy, and invaded the galaxy in a sort of holy war. They were basically a race of Amish fantasy monsters on their version of the Crusades, sprinkled heavily with how certain people in Europe and the United States view Muslim extremists. You can immediately see the problem. The Yuuzhan Vong were first named in the New Jedi Order books in 1999, and the best analogy for them is that they were Star Wars’ attempt at an event comic. Obviously, the Star Wars books always shared a universe, but events only happened to specific characters. But the Yuuzhan Vong affected everything and everyone in the galaxy, and for years. The reasoning behind the Yuuzhan Vong is both obvious and sound; after several years, the Expanded Universe novels were in a rut where someone would take control of what was left of the Empire, have some success, but eventually be defeated by the New Republic. There might be some Dark Side of the Force aspect at work, too, with a 50/50 chance that Luke himself was more or less responsible for it. The Yuuzhan Vong was an attempt to change up the villains and have the very interesting idea of forcing the New Republic and remaining parts of the Empire to work together. Except it wasn’t interesting. As villains, the Yuuzhan Vong had very little depth to begin with. But since 9/11 occurred right in the middle of the New Jedi Order book series that covered the Yuuzhan Vong War, they became clear analogs of religious extremism and terrorism. It was a ham-fisted allegory that also failed to bring anything new to the Expanded Universe, other than killing well-liked characters (RIP Chewie) or character-assassinating them (RIP Jacen Solo). Sometimes both! All of that completely overshadowed anything interesting the idea could have brought. These were hardly the only problems. The threat posed by the Yuuzhan Vong was used to retcon some things that didn’t need retconning. First and foremost, it was implied that Palpatine created the Empire because he had a vision of a great danger from outside the galaxy... that turned out to be the Yuuzhan Vong. And Thrawn joined the Empire because that was, in his mind, the best way to defend against the oncoming Vong. The former is worse than the latter, because giving Palpatine a “justification” for his actions in the movies doesn’t work at all. He was a megalomaniacal dictator, pure and simple. Besides, if he did know about a major oncoming threat, revealing it would have made it a lot easier to control his subjects, if not create the Empire. Either way, he would absolutely have been talking about them all the time. For Thrawn, it’s easier to buy but is also a case of helping give a character who was indisputably on the “wrong” side an out. By the time this was revealed, Thrawn was extremely popular, so this makes it “easier” to like him, which is a disservice to what made him interesting in the first place. It’s not that I think the Yuuzhan Vong specifically are going to return. The name is so poisoned in people’s minds that I doubt anyone at Lucasfilm would greenlight it this time around. However, I am worried that we are heading towards another “danger from beyond” confrontation with a Yuuzhan Vong analog. And I’m worried that Palpatine having a justification for creating the Empire and Thrawn’s reasons for joining it are going to come back with that idea. “I will learn of them soon enough on my own,” the Emperor countered placidly. While I like to see writers exploring possibilities in the Star Wars universe—and the tendency to adhere to the original trilogy is a criticism both new movies have gotten—this particular one was too far removed from what made Star Wars work. And they tried and it failed. It failed hard. So why would they go and do it again? 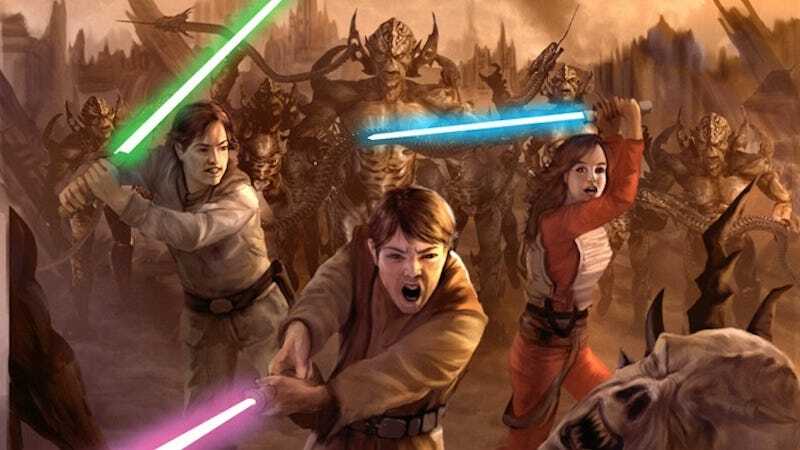 Yes, there is a very interesting idea in having a Star Wars conflict that isn’t the Republic (old or new) versus the Empire, but recreating any part of the Yuuzhan Vong arc is not it. Not everything in the old Expanded Universe needs to return to the canon, and a lot of it shouldn’t. The Yuuzhan Vong are proof.